You are here: Home / Sweepstakes / Enter to Win Travel and Accommodations for 8 with Disney Movie Rewards! Enter to Win Travel and Accommodations for 8 with Disney Movie Rewards! If you are a Disney Rewards Member (or sign up to become one – it’s FREE! 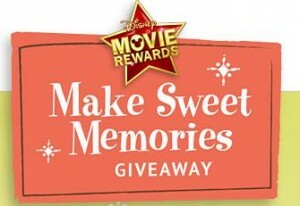 ), head over here to enter to win 1 of 30,000 prizes in their Make Sweet Memories Giveaway! Prizes range from Disney Movie Rewards points to the Grand Prize of Travel and Accommodations for 8 from Delta Vacations! You first entry is FREE. Each additional entry is 5 Disney Movie Rewards points.